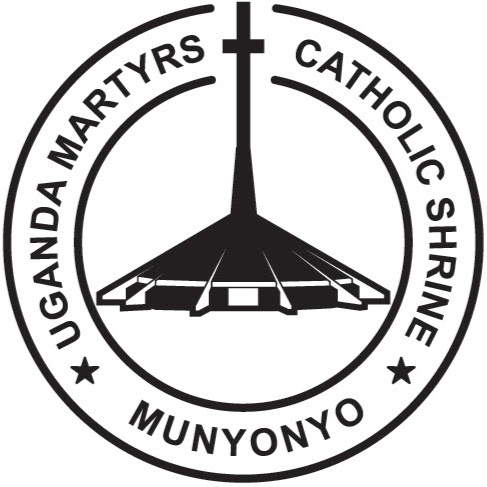 On Mission Sunday, 18 October 1964, the twenty-two Catholic Martyrs of Uganda were solemnly proclaimed Saints by Pope Paul VI in St. Peter’s Basilica, Rome. 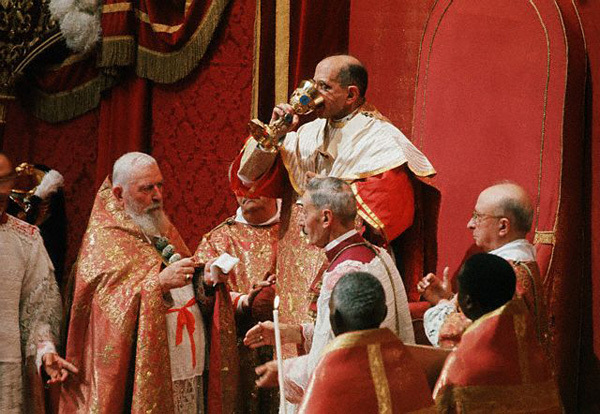 The impressive ceremony with its age-old rites and traditional pomp and pageantry was rendered even more colourful and spectacular than usual by the presence of the vast majority of the Cardinals, Patriarchs, Archbishops and Bishops of the Catholic Church, gathered in Rome for the Second Vatican Council. Also present were representatives of the Government of Uganda, the Kabaka of Buganda and other countries, and also over two hundred clergy, religious and lay people from the land of the martyrs. This unique occasion, when for the first time people of Central Africa were to take their place in the glorious army of saints, was greeted with a sound never before heard in St. Peter’s, the pulsating rhythm of African drums and other instruments, as the long Papal procession filed into the great basilica. 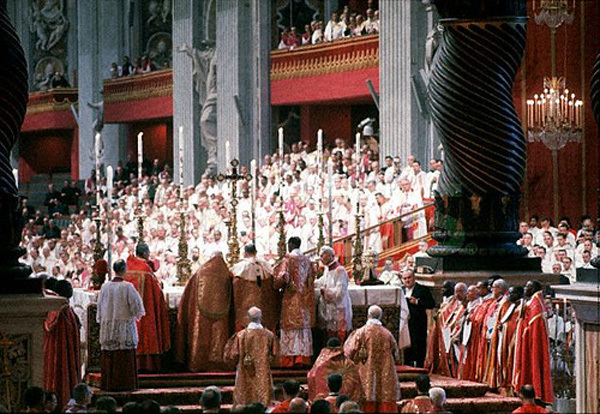 During the singing of the Litany of the Saints, the Cardinals and Patriarchs approached the Papal throne, one by one, to pay homage to the Supreme Pontiff. Then, the Cardinal Postulator of the cause of the martyrs, using the traditional formula, urgently, more urgently and most urgently (instanter, instantius, instantissime) begged the Pope to proclaim the Martyrs of Uganda as Saints of God. A secretary replied, on behalf of the Pope, that His Holiness was prepared to grant this request, but first called for prayers and the invocation of the assistance of the Holy Spirit. After a pause for silent prayer the Holy Father intoned the hymn to the Holy Spirit, ‘Veni Creator Spiritus’, which was taken up and sung by all present. ‘To the honour of the Holy and Indivisible Trinity, for the exaltation of the Catholic Faith and the increase of the Christian Religion; by the authority of Our Lord Jesus Christ, of the Holy Apostles Peter and Paul, and Our own; after mature deliberation and frequent prayer for divine guidance, and with the advice of Our venerable brethren, the Cardinals, Patriarchs, Archbishops and Bishops of the Holy Roman Church present in the city. We decree and define as Holy, and inscribe in the Roll of Saints, the Blessed Charles Lwanga, Matthias Mulumba Kalemba and their twenty companions. 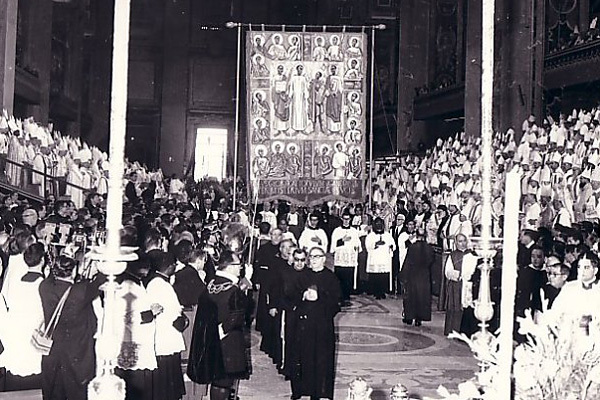 We decree that their memory be commemorated by the Universal Church with pious devotion, each year on 3 June. In the name of the Father and of the Son and of the Holy Spirit. Amen.